The equipment works perfectly, the disc loads ok and the casing lacks a clamping screw on the side of the floppy disk drive, so I assume that the belt has changed. 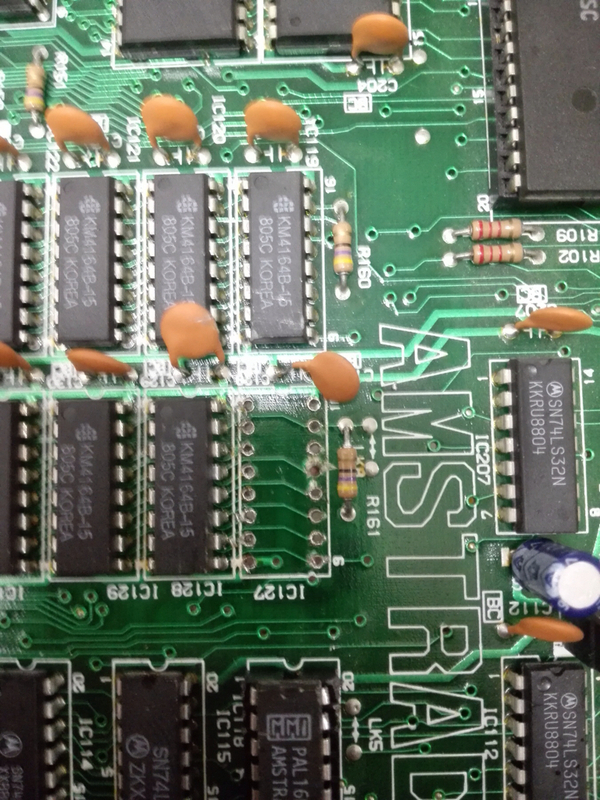 I opened the CPC and I have not seen anything wrong, no sign of rust or dirt on the chip, I do not want to have to change the memory chips because I do not know where to find the chips and then to desolder the 128 contacts and re-solder them is not for my pulse or my ability. 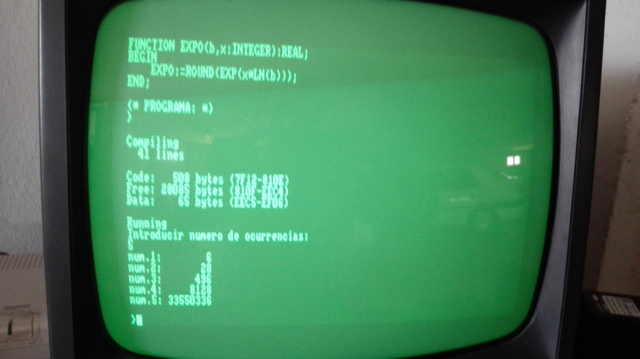 I have tried with an X-mem that I have of my CPC464 (I have tried putting the selector in both mode 6128 and 464) with the hope that when starting replace the extension of 64 Kb by the extension of 512 Kb. In the boot reports that it has 576 Kb (64 + 512) but it still fails the same. "Standard expansions can contain between 64K and 512K memory. so, the resulting size is only nn+64 Kbytes, not nn+128 Kbytes"
Is there any way to disable the second bank and use the extension memory of the X-Mem? Could the problem be something other than the second memory bank? External extension memory should take over internal one. A failing PAL could also be the cause of extension memory issue. Is this the 'trick' you were thinking of Bryce ? The forum search isn't my friend either, I rarely find what I am looking for. Today I have run the test and ... the expanded memory is ok! but not the first 64kb. Four isolated lines appear, always in the same place and in the fourth pass. and I run dbase and turbo pascal without problems. 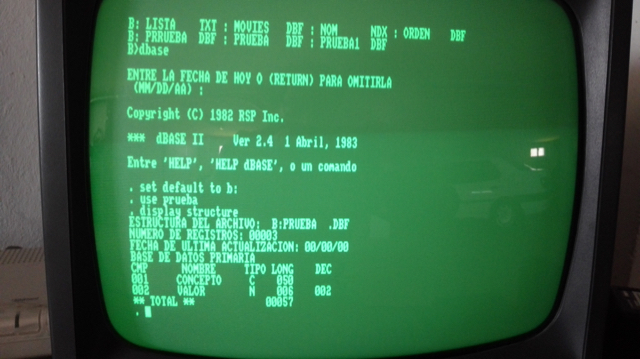 I have loaded several games (indiana Jones, rambo, La abadía del crimen, ...) and everything ok. Only the CP/M plus load fails, I have also tried the Vortex one with the same result. The test is running two test pass, resulting in 4 pass on the screen. - 1st pass write all detected bank with a constant byte (unique per bank) then read and check. That's fast, but cannot detect some memory fault. A dead device will be spotted. - 2nd pass fill the back with random generated data that are unique for each bank. That's slow, but will detect some other type of errors, like addressing error. Both pass also fill the main back (base line) block from 0x4000-07fff where the other bank are switched. That range is checked after all extension banks are tested. The isolated lines mean that the some part of base RAM has been corrupted during the filling of the extension banks, which is not good. One vertical bar represent 512 bytes. However this test is not precise enough to know what is the exact problem. I repeat the test with the same result. 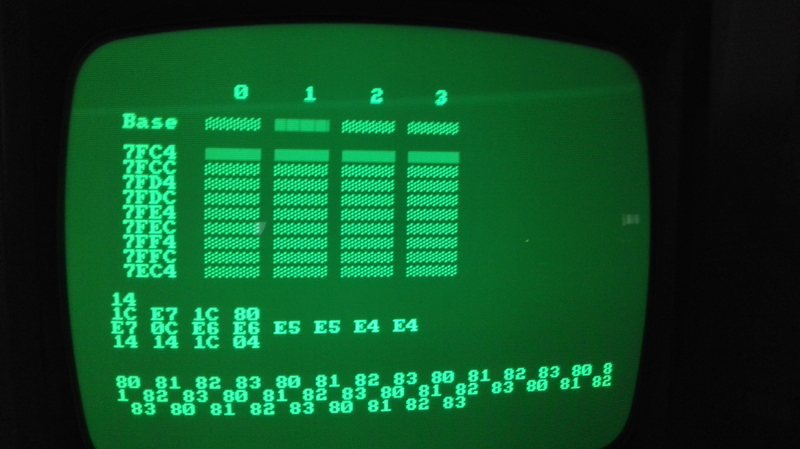 The 8 bytes of memory addresses on the screen (bigger than &C000) correspond exactly to the points that fail in the fill command. Could it be inferred that the memory chip that fails is one in particular? In a 6128, the RAM is made of 64k x 1 bit slices. I guess that your test is only checking the base RAM from 0x4000 to 0xFFFF ? Can you see the dots that should be there is you only poke &01 to the failing address is the C000-FFFF range ? Yes, only from &4000 to &FFFF. POKE &CD71, 2 does show a point, and PEEK (&CD71) shows a 1. Same for the other addresses. 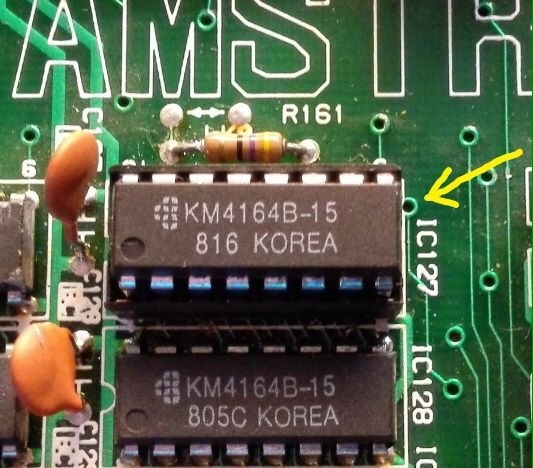 So the bit 0 RAM is faulty and you should replace IC127 according to the schematic. I'm preparing to do something similar to this .. and have the same memory chips .. so very interested in your progress. 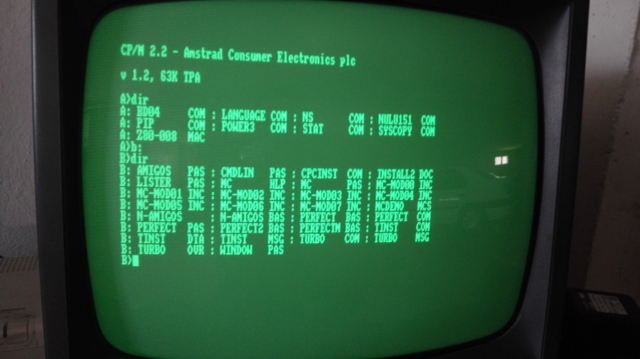 @angelcaio Thanks for the ref to that thread, definitely looks like the same symptoms I'm experiencing with my CPC6128 .. I haven't had the time this week to debug things (not even opened the case yet) but I hope this weekend I will be able to break out the scope and do some debugging .. certainly interested in your results too, so I hope you get it sorted as well. Hi. Today I have finally armed myself with courage and the help of a friend with more pulse and skill than me. 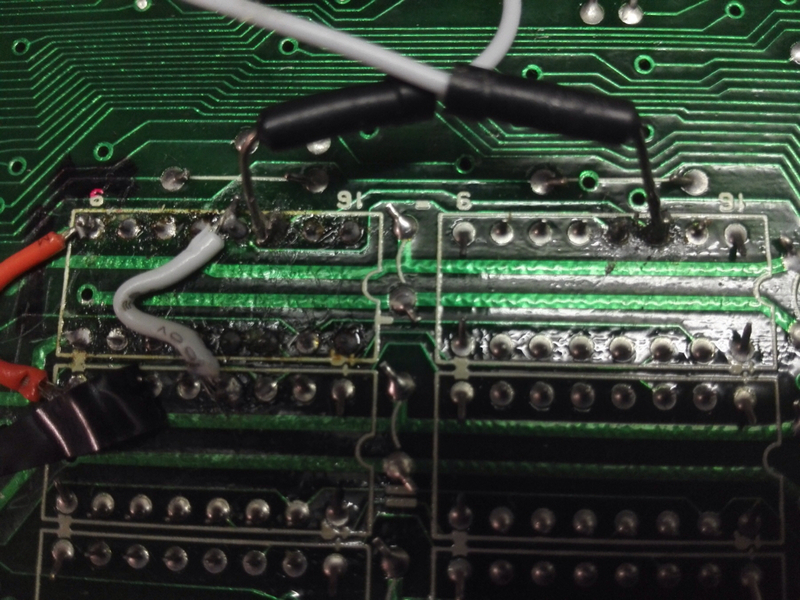 We have de solder the chip IC127 (with some difficulty) and we have mounted a socket in its place. 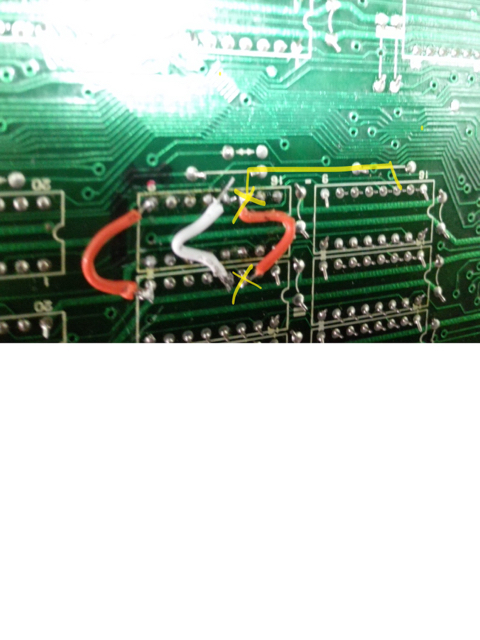 Then we have measured the continuity and we have found some pins that did not add value and we have made some bridges, we have measured again with the multimeter and in all there was voltage already. 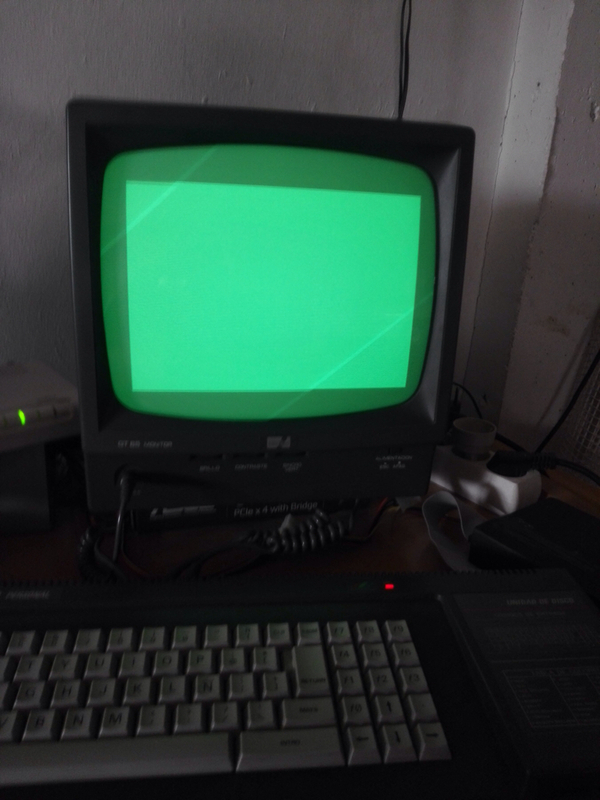 We have inserted the memory chip but now only a green screen appears with the dark border. Can it be the chip ?. They are the same timing as the rest and I have tried the two that I bought with the same result. Can you double check the connection to the RAM ? All pin should be connected to the RAM device below, except DOUT. oups, just see that you connected DOUT to the chip below, which is wrong. thank you very much, Gerald. I'm not sure I understood you. Should I just break the bridge between 14 and 14 below or should I also bridge with 14 next to it? 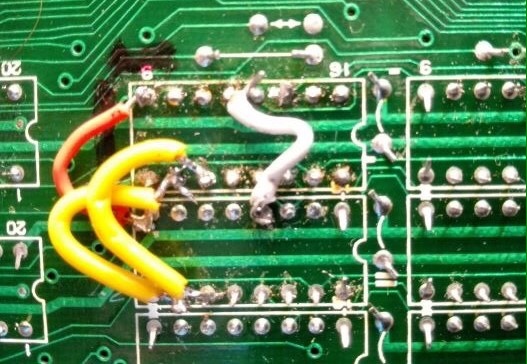 At first, just remove the re wire you marked. Then test that the connection between pin 14 of both IC (IC127 / IC119) is OK . If not, add one wire. Hi. I tried it first by removing the bridge and it did not work. Then I have joined both pins 14 in bank0 and bank1, but it remains the same. 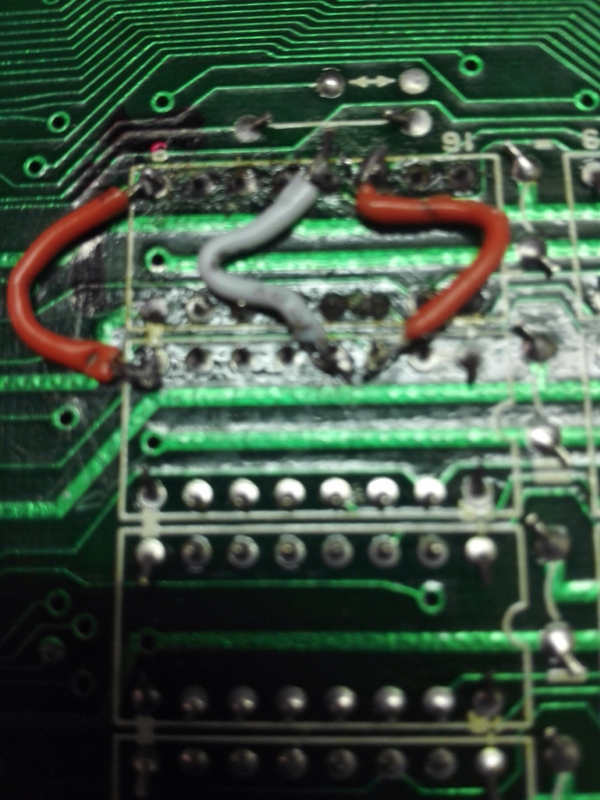 I do not have a multimeter to check both pins 14 but I guess welding makes contact. Maybe something else was damaged in the process. Without beeing able to check continuity between pins it will be difficult to make any diagnostic. That's the bare minimum. 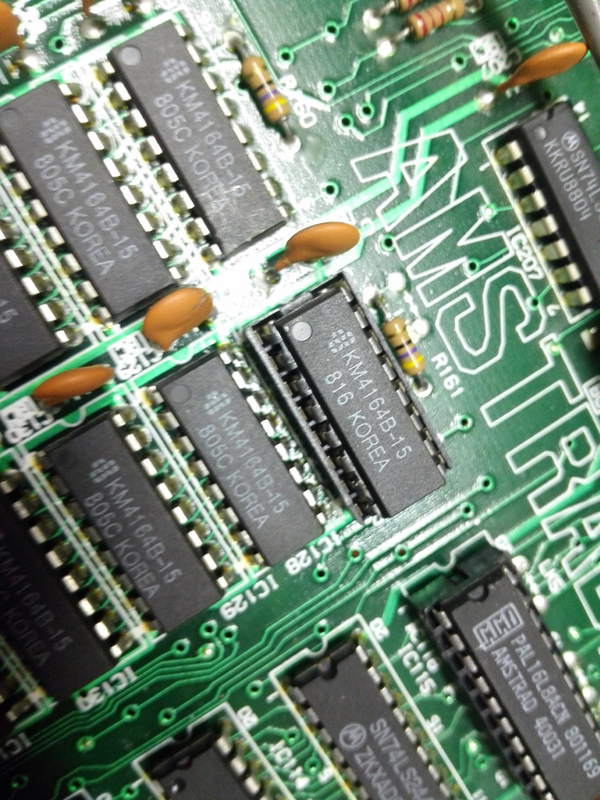 I have tried two chips KM4164B-15 with the same result. Honestly, I can't think of anything else to try. Any idea? Page created in 0.269 seconds with 105 queries.